The first time I walked into a public school kindergarten classroom as an adult I was horrified. I was so shocked I actually asked the teacher if I was in the right place. “Is this kindergarten or first grade?” I asked. No, this is kindergarten. I looked around, stunned. There were no toys, no play areas, no sand table or class pets. There were rows of desks, some cabinets to hold supplies, and a small area to the side for circle time with a calendar. 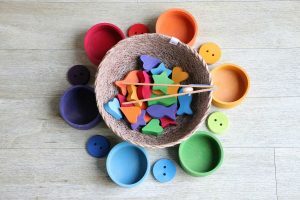 As an occupational therapist, I had hoped to be able to guide the child I was there to see, through some solid play that would help them develop skills in their classroom. Instead, I took the child out of class each week to play games to develop fine motor skills, attention span, and direction following. These are skills that are essential to a child’s well being and development for life. Children used to get them through play, not therapy. Where had the developmentally appropriate kindergarten gone? When kindergarten was invented in Germany, over 100 years ago, it was designed with purposeful play. The word “kindergartner” meant teacher, not the children. The teachers were “gardening” the children, helping them bloom and grow. The children in kindergarten were a range of ages in classrooms full of toys, songs, and games. The idea traveled to America, where “educational reform” changed it over and over again. The classroom I walked into in 2007, was part of the No Child Left Behind program. This initiative was aimed at helping children and schools succeed. But it was flawed and did not take into account the logic and reason of how children actually learn. Common Core has taken this problem and made it ever so much worse. 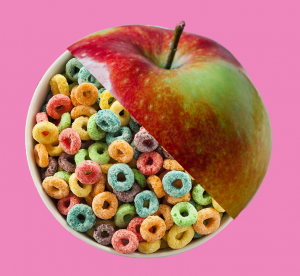 Common Core Kindergarten is to Developmentally Appropriate Kindergarten as sugar cereal is to apples. One helps your child develop into a healthy person, the other is just faking it. Giving this generation of children Common Core kindergarten is like giving them sugar cereal and saying it is wonderful because it is fortified with vitamins. But the truth is children need vitamins from real sources, like fruit, vegetables, meat, and eggs. Getting those complex foods into a child is a lot of work, but it does a lot of things on the inside of the child, that you can’t see. The cereal sounds like a great replacement, full of vitamins and minerals, but it lacks fiber, protein, amino-acids and complex carbohydrates that children need to be healthy. Developmentally appropriate kindergarten is much like a feeding a child healthy, whole food. Yes, it helps them today but the long-term goal is that the child will be stronger and healthier for life. Common Core is short-sighted, like the mom giving her kid sugar cereal every day. Yes, they ate, but the long-term consequences to their health are being ignored. In a developmentally appropriate kindergarten, children build foundational skills. They build social skills for life, through playing dress-up, house, and building with blocks together. 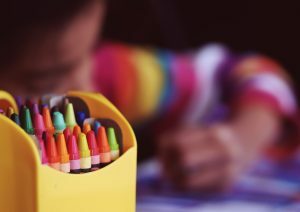 Children develop fine motor skills needed for writing through painting, stacking blocks, dressing dolls and making crafts. They develop the foundation for complex thought by learning to sing and skip at the same time. Playing games teaches children to follow directions. And learning stories, songs, and nursery rhymes foster a relationship with language. In all these ways, children build a foundation that will support their education for a lifetime. Common Core kindergarten skips the foundation and goes straight to the upper-level skills of reading, writing, and math. This is just like building a house without a foundation. Eventually, the house is going to crack and shift. In our children, we see problems like bullying because the kids never learned social skills. We see older kids with horrible handwriting because they didn’t get time to develop the fine motor skills they needed. We see kids who are struggling, stressed and burned out on school in elementary school because they didn’t get time to learn the foundation. Reading and writing require a very high level of integration between the brain and body. The eyes must discern minute differences in lines and curves to know the difference between “h” and “n”, for example. How do we develop that skill? By just starting to read? No. We develop it by using our eyes to look around while we run, jump, swing, make crafts and play games. Our eyes practice focusing over and over while we do those things, strengthening tiny muscles we don’t even know are there. When those muscles are strong enough, a child can easily look at letter after letter, and tell them apart. Then they can start learning how to read. The play of childhood looks useless to adults. But it is play that creates a foundation for our children to learn and grow and bloom, which is what kindergarten should be about. Lately, I’ve been sad to see the Common Core ideas that don’t give kids foundational skills slipping into the homeschool community. The original kindergarten teachers had the training to know how to help their children blossom, I realized. Parents need a guide to help them build a good foundation with their child. So, I wrote Five Senses Literature Lessons, Orange Level, a guide to having a fun, interesting and developmentally appropriate kindergarten year. 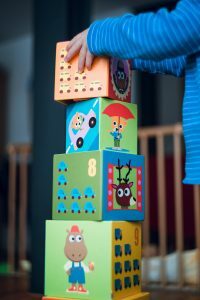 Beyond the list of suggested books and activities, just add some dolls, blocks, and playdates to help your child build a wonderful foundation. Want to see what developmentally appropriate kindergarten looks like? Download our free sample lesson from the Level Orange: Full-Year and see for yourself how different kindergarten can be when it is working with your child’s physical, mental and emotional development.